In the early seventies, linguists from the University of Alaska Fairbanks partnered with local experts to create a standardized written version of the Inupiaq language. Shishmaref is extremely lucky to have one of the local experts in our village. John Sinnok was instrumental in creating the written version of Inupiaq and preserving our local dialect. 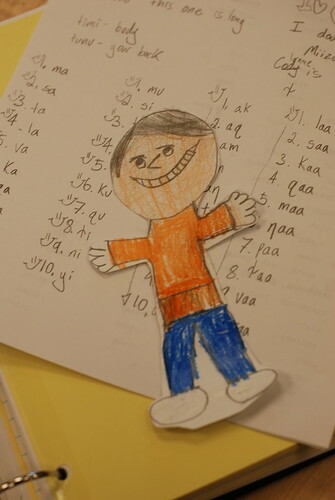 He taught a basic Inupiaq Writing class during Inupiaq Days, and Flat Stanley and I attended. This is the "belted l." You begin pronouncing it like you would a regular English "l," but then you make a sound kind of like you're clearing your throat. This is the dotted g. It's pronounced kind of like the belted l. You begin pronouncing it like an English g and end with a sound like you're clearing your throat. This is the "n" with a tail. It is pronounced like the "ng" in "song." -the letter "v" makes a "b" sound if it precedes the letters "l" or "z"
-zr together sounds like "sh"
Inupiaq only has three vowels: a, i, and u, but they can be combined in nine different ways, each with its own pronunciation. 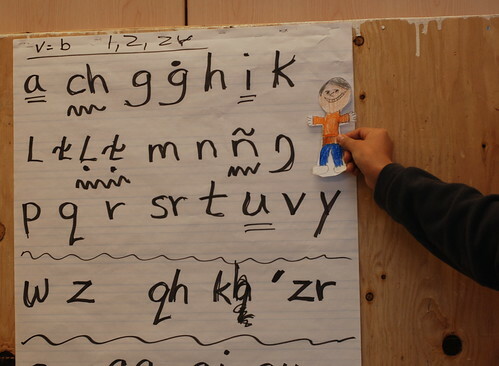 After learning the basic phonics of Inupiaq, John gave us a series of quizzes. 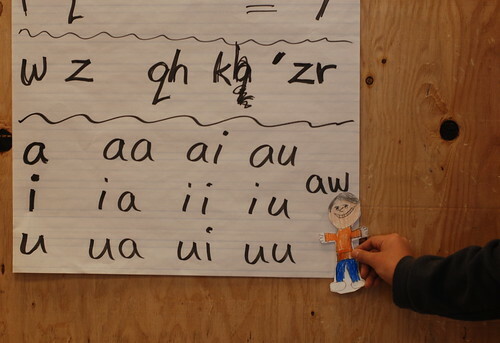 He would say words or letter combinations, and we had to write them down, spelling them according to Inupiaq phonics. Flat Stanley and I did AWESOME on the quizzes until John got to the six- and seven-letter words. Then we started tanking it. Get the Alaska Teacher Newsletter!! !